Our services are available throughout the central Florida region. From Sarasota to Tampa on the Gulf side through Orlando and out to West Palm Beach on the Ocean side. It’s not every day you see something like this at 12:30 in the afternoon. 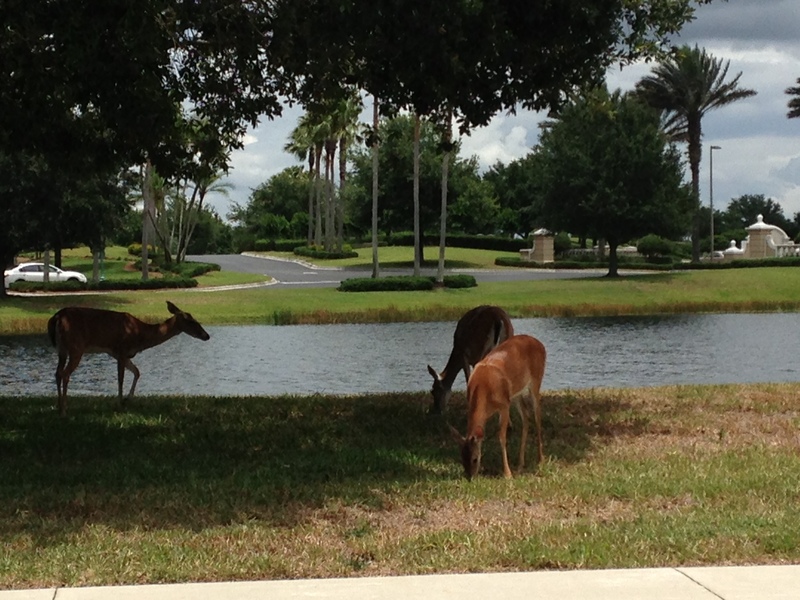 Deer, grazing in the middle of Lakewood Ranch! I snapped a picture on my way to a consultation the other day. This is one of the reasons I love my job. At any hour of the day or night I get to see wildlife. Whether it’s deer eating plants by a retention pond or cranes and pelicans flying overhead, I never get tired of it. Of course, seeing deer eating plants isn’t that great if they’re eating the plants in your yard, but that’s why it’s good to have the number of a reliable and professional wildlife removal service like mine. I can help you discourage deer from foraging in your landscape because I know what kind of plants and scents they don’t like. I can also trap them, if that’s what’s needed. There’s a little downside to my work, though. I also do dead deer removal. If a deer’s been hit in front of your house, I’m the one to call. In my company, dead deer removal is done quickly and respectfully, taking care of the problem for you and your neighbors with a minimum of fuss. This service extends to all types of dead animal removal. From rodents indoors to birds, alligators, snakes, armadillos outdoors or any poor creature with bad luck, we take care of them all. Few things are as messy and sad as dead animal removal. That’s why a picture like this reminds me why I love my job. After a long day, or even the start of one, the sight of deer, calmly grazing without a worry in the world, just makes the day better! We have the experience and the tools to quickly and professionally solve your animal control problems. For a consultation, give us a call at 866-263-9453 (toll free). There are many pest control companies for animals in Fort Myers, but not all of them are licensed and insured professionals. Make sure that you hire a competent expert for your Fort Myers exterminator. At Nuisance Wildlife Trapper, we will be courteous and friendly and take the time to answer your questions. Give our experienced staff in the Fort Myers area a call, and we will listen to your problem, and make an appointment to perform an inspection. Florida is full of wildlife, including snakes, squirrels, raccoon, opossum, and more. You will need a professional in wildlife removal in the Fort Myers area. When it comes to catching a snake or raccoon control, you will need help if you can’t trap the wild animal on your own. Also you will most likely need to perform full repairs and prevention to keep pests out for good. We perform the repairs and decontamination if necessary. Rats and mice love to live in attics, and can chew wires or leave droppings. In fact the wildlife in the Fort Myers area frequently enter homes, and it takes a pest management company to remove them. We are Fort Myers best wildlife management experts, and are familiar with all the pest animals. Including all species of Florida snakes and bats. We at Wildlife Trapper are the best among Fort Myers nuisance wildlife companies and can solve all animal damage issues. Our wildlife operators are skilled at bird control and bat removal, and would be happy to serve your Fort Myers bat control or pigeon and bird control needs with a professional solution. Opossums, skunks, moles, and other animals that can damage your lawn – we are the exterminators who can capture and remove them. Our professional pest management of wildlife and animals can solve all of your Fort Myers animal control and capture needs. Give us a call at 866-263-WILD for a price quote and more information. There are many North Port pest control companies for animals out there, but not all of them are licensed and insured professionals. Make sure that you hire a competent expert for your North Port exterminator of wildlife. At Wildlife Trapper, we will be courteous and friendly and take the time to answer your questions. Give our North Port trappers at Wildlife Trapper a call, and we will listen to your problem, and make an appointment to perform an inspection. Florida is full of wildlife, including snakes, squirrels, raccoons, opossums, and more. You will need professional North Port snake removal or raccoon control if you can’t trap the wild animal on your own and perform full repairs and prevention to keep pests out for good. We perform the repairs and decontamination if necessary. Rats and mice love to live in attics, and can chew wires or leave droppings. In fact North Port wildlife frequently enter homes, and it takes a pest management company to remove them. We are North Port wildlife management experts, and are familiar with all the pest animals, including all species of Florida snakes and bats. We at Wildlife Trapper are the best among North Port nuisance wildlife companies and can solve all animal damage issues. Our wildlife operators are skilled at bird control and bat removal, and would be happy to serve your North Port bat control or pigeon and bird control needs with a professional solution. Opossums, skunks, moles, and other animals that can damage your lawn – we are the exterminators who can capture and remove them. Our professional pest management of wildlife and animals can solve all of your North Port animal control and capture needs. Give us a call at 941-729-2103 for a price quote and more information. There are many Venice pest control companies for animals out there, but not all of them are licensed and insured professionals. Make sure that you hire a competent expert for your Venice exterminator of wildlife. At Wildlife Trapper, we will be courteous and friendly and take the time to answer your questions. Give our Venice trappers at Wildlife Trapper a call, and we will listen to your problem, and make an appointment to perform an inspection. Florida is full of wildlife, including snakes, squirrels, raccoons, opossums, and more. You will need professional Venice snake removal or raccoon control if you can’t trap the wild animal on your own and perform full repairs and prevention to keep pests out for good. We perform the repairs and decontamination if necessary. Rats and mice love to live in attics, and can chew wires or leave droppings. In fact Venice wildlife frequently enter homes, and it takes a pest management company to remove them. We are Venice wildlife management experts, and are familiar with all the pest animals, including all species of Florida snakes and bats. We at Wildlife Trapper are the best among Venice nuisance wildlife companies and can solve all animal damage issues. Our wildlife operators are skilled at bird control and bat removal, and would be happy to serve your Venice bat control or pigeon and bird control needs with a professional solution. Opossums, skunks, moles, and other animals that can damage your lawn – we are the exterminators who can capture and remove them. Our professional pest management of wildlife and animals can solve all of your Venice animal control and capture needs. Give us a call at 941-729-2103 for a price quote and more information. Nuisance Wildlife Removal Inc. is very well known in Bradenton, Florida as the go-to expert with the highest experience level in solving difficult insect and pest infestations efficiently and easily. We employ advanced technology such as the Flir thermographic cameras and Go-pro. This reduces the amount of damage to your structure and which will in turn reduce the overall cost of your project. Nuisance Wildlife Removal Inc. is fully licensed and insured. We are a locally and family-owned business that has been operating in Manatee and Sarasota county for 20 years. We are the REAL experts with the LONG-TERM experience in Bradenton, that can save you from costly mistakes. Don’t trust your home or budget to a new guy on the block. Call today and speak with a trusted professional. There are many Bradenton pest control companies for animals out there, but not all of them are licensed and insured professionals. Make sure that you hire a competent expert for your Bradenton exterminator of wildlife. At Nuisance Wildlife Removal Inc. we will be courteous and friendly and take the time to answer your questions. 1-866-263-WILD! We want to know about your current situation. Florida is full of wildlife, including snakes, squirrels, raccoons, opossums, and more. You will need a professional Bradenton/Sarasota wild animal control service for your animal control and removal, if you can’t trap the wild animal on your own. The next step is to perform full repairs and prevention to keep pests out for good. We perform the repairs and decontamination if necessary. Rats and mice love to live in attics, and can chew wires or leave droppings. In fact, Bradenton wildlife frequently enter homes, and it takes a professional pest management company to remove them. We are Bradenton/Sarasota wildlife management experts, and are familiar with all the pest animals, including all species of Florida snakes and bats. We at Nuisance Wildlife Removal Inc are the best among Bradenton nuisance wildlife companies. You have our guarantee to prove it! We are a local and family owned business, effectively solving the most difficult nuisance animal infestations for over 20 years. Give us a call for a price quote or more information. Or easily contact us by clicking here.